It is important to prune trees every year or so. Pruning trees regularly helps improve the trees health and maintains its shape and size as well as providing safety benefits. I used to use a Fiskars 9301 Power-Lever 14-Foot Tree Pruner but it somehow got misplaced and I decided to purchase a Fiskars 9240-6935 Telescoping Pruning Stik to replace it. I wanted to stay with Fiskars because their tools have always held up well and they have a good reputation. Both tools include a bypass pruner as well as a detachable 15" saw blade for cutting larger branches and telescope to reach higher branches but there are some features of the Pruning Stik that won me over. Update (7/13/2013): There are some tools you don't use often but are very important when you need them. I've had the Fiskars Pruning Stik for a number of years and have never regretted the purchase. I keep my trees trimmed and healthy. During Superstorm Sandy, while other trees were getting damaged and falling one large tree on my property didn't have any problems. Well, other than another tree falling on it that is :) Using this pruner helped me get some of the other tree clear of windows so they wouldn't break from the weight of the fallen tree and I was able to trim any damaged branches on my tree, as well as pluck off dead branches from the tree that fell on to prevent them from falling on anyone. When I first bought it, I didn't think I'd use it as often as I do because I don't have that many trees but the few times a year I do use it have been worth the modest price I paid. I don't have a lot of trees, one large maple, and some smaller trees for privacy and decoration including arborvitae, hemlocks and cypress. The smaller trees weren't a big problem. I'm tall so I was able to prune them effectively with a hand pruner and a 32" bypass lopper . The taller ones were close to the house and I was able to use a ladder to reach the tops. The tall maple tree was more of a problem. Before I had the tree pruner I would just reach up and grab branches and use the pruner or lopper to trim the lower branches that were too low above sidewalks, pahways and the driveway. It was easier with two people as one could use a garden hoe to lower some branches and the other could prune them. This wasn't ideal. I couldn't give the tree a good pruning to deal with problems higher up such as dead branches, limbs that rubbed against each other, branches that got too close to the house and allowed squirrels on the roof or to be able to open up the tree to allow more sunlight on the lawn to help it grow. 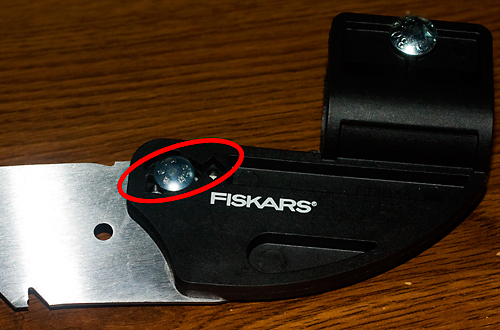 The Fiskars 9301 Power-Lever 14-Foot Tree Pruner allowed me to address those issues. It was a very good pruner with good reach. The saw blade was very sharp as were the bypass cutters. I decided to replace it with the Fiskars 12' Telescoping Pruning Stik because I didn't need the extra reach and the Pruning Stik offers some unique features that I thought would make it easier to use. After having the opportunity to use the Pruning Stik a few times I'm very happy I chose to purchase it. 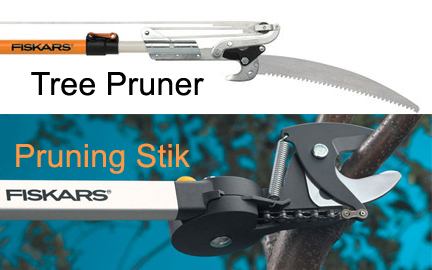 Both the Pruning Stik are Tree Pruner are fairly light, which makes them easy to handle, yet very stiff and durable. They both offer bypass cutters for small branches (1 1/8" for the Tree Pruner and 1 1/4" for the Pruning Stick) and a 15" detachable saw blade for larger limbs. Even with the Pruning Stick and Tree Pruner fully extended they were very easy to handle. There is a slight bit of wobble when fully extended but not enough to make it unmanageable. The quick release works well and has held up to multiple uses. I typically extend and retract the pole after almost every cut because I can be a bit clumsy. The shorter length makes it easier to manage and I don't have to worry as much about accidentally hitting and breaking something. The big advantages of the Pruning Stick for me were the rotating cutting head and the ergonomic handle instead of the rope. On the Tree Pruner the bypass cutter is in a fixed position. You hook it over the branch you want to prune then pull the rope. The saw blade is removable but can be left on while using the bypass pruners. The Pruning Stik also has a removable saw blade but the instructions state that you should not use the bypass pruner with the saw blade attached. The pruning head rotates 240 degrees. Simple unlock the head using a plastic lever, rotate the head to the angle you desire and lock the head using the lever. It's very simple. I find coming under a branch and pruning it easier for me and being able to change the angle of the head made it a lot easier to get to branches growing in different directions. It was especially helpful for branches that were growing straight up from the main branch. The Pruning Stik comes with a detachable saw blade that converts the Pruning Stik into a pole saw. The blade is very sharp and even when fully extended I had an easy time cutting thick branches that were too thick for the bypass cutters. I use the bypass cutters more than the saw so I don't mind having to take a few seconds to screw on the saw blade using the wing nut if I need it. The angle of the saw blade on the Pruning Stik also can be adjusted to a few different positions by simply unscrewing the wing nut and repositioning the bolt into a different hole on the saw blade holder then re attaching the wing nut. There's a decent bit of adjustment available. I didn't use the saw much on the Tree Pruner and can't remember if there was any adjustment available on it. The biggest benefit of the Pruning Stik is the ropeless design. Sometimes between getting the pruner where I want it and sweating hands in the heat I accidentally let go of the rope and it swings out of reach. With the Pruning Stick that's not a problem. There's an orange handle that you pull, which in turn pulls a strap which pulls a chain which moves the cutting head. 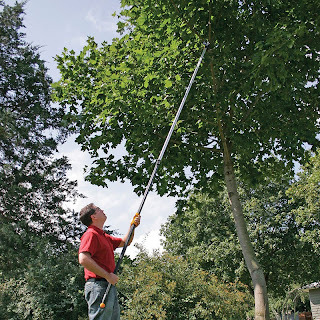 The handle is in a good location that allows you to have good control of the pruner by keeping both hands on the pole as opposed the a rope based design like the Tree Pruner. There's also an orange ball at the bottom of the Pruning Stik that engages the bypass blade in case you are reaching a high branch that puts the main handle out of reach. Simply pull the orange ball to cut with the bypass pruner. This was a little more difficult for me to use. I didn't have to go too high but I did use this feature a few times. By steading the Pruning Stick on the branch I was cutting, the light weight of the tool made it easy to keep in place with one hand while the other pulled the orange ball. When you pull on the orange ball, the orange handle slides down as well so I was also able to pull on the orange ball to bring the regular handle down enough where I could reach it and continue the cut with both hands on the Pruning Stick. The Fiskars 9240-6935 Telescoping Pruning Stik is a great tool for the homeowner that wants to maintain the trees on their property. It's light and strong which makes it easy to use and it comes with a lifetime warranty. I found it very easy to use and faster than my old Tree Pruner. The adjustable head made it easier to get to some branches that I previously couldn't get at. The telescoping action is very easy. Just flip a lever, pull out the top and then flip the lever to tighten. Even fully extended it was easy to use and the cutting blades were very sharp. It required very little effort to cut even 1" diameter branches. If you have any trees on your property having this pruning stick will make it easier to keep your trees maintained and costs much less than having a professional prune a single tree in my area. I purchased mine from Amazon because it had the lowest price at the time. It's a little more than the Tree Pruner but well worth the price in my opinion because it makes tree pruning easier. The ropeless design is also a great feature that makes setup and storage a breeze.